Last week the Ludens were set a mission to document a day for the others, ideally in real-time updates. The participants seemed to take to this very well, investigating innovative ways of exploring the strange world of the Sapiens and reporting back helpful information. Visual reporting is an important element of The Game, and one which most of the Ludens wanted to take advantage of. Stainbear and Eliffant opened Flickr accounts to document their activities, here and here. Stainbear started to update directly from a mobile device to Flickr which got picked up by Twitterfeed (an RSS feed -> Twitter forwarder) and in between used Twhirl - this is obviously a very tech-savvy bear! The advantages of this meant that we were able to see near real-time updates as Stainbear and Eliffant met up in town to watch the Sapiens dancing, although Flickr posts pictures with a repetitive message that got a bit tiresome after a while. There’s also a bit of a wait for the feed to get picked up. Lepufo was inspired by their methods and tried to extend the chain from Phone to Flickr to Blog to Twitter, but this caused even more delays in updating and was abandoned. Furpile used Myspace to load up photos but these can only be seen by other users, so they also had to use Photobucket for some things. The most popular method of updating with images was TwitPic, which lets you send photos to Twitter from the TwitPic site or via email/mms. Unfortunately some phones don’t allow you to add a subject line (used as the text of the Twitter update) and there’s sometimes a delay between sending and it arriving on your TwitPic page. Lepufo started a Wordpress blog and so was able to expand on activities more than Twitter allows, whilst also showing Twitter and Flickr feeds in the sidebar. Furpile tried the ‘old skool’ approach of a Myspace page with a blog, but didn’t find it very fruitful, mostly due to problems uploading and sharing media. LeonHerring went for a Blogspot blog which could also have Twitter updates in the sidelines, but was mainly useful for bringing the text and images together in a more coherent way. Furpile created a bizarre little animation of stills blended together in a primitive way with a Patsy Cline backing track. This starts off being quite amusing, but feels more ambiguous by the end. Mirror Mirror from Lepufo on Vimeo. Lots of the avatars seemed interested in the eating habits of Sapiens. 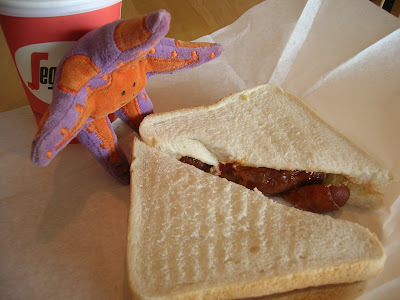 Eliffant investigated toast and pizza, finding the shapes and textures of each as important to report as the taste. Many of the avatars got taken out to pubs, with varying levels of enjoyment. Stainbear seemed quite happy in bars, noting that Sapiens were very fond of something called ‘beer’. Small Domestic Appliances (SDAs) featured heavily, Eliffant enjoyed the toaster and thought other kitchen appliances could be useful in The Game. ‘Tellyboxes’ were generally popular, although ‘glowboxes’ (computers) and ‘mini-glowboxes’ (mobile phones) seemed more problematic. cross_triangle had many frightening encounters with everyday items, including plastic bags, books and an iron which caused a suspenseful series of updates: you could sense the sizzling through the screen. This first real assignment for the avatars gave us lots of insights into how the Emergent Game might be played, the kinds of applications and technology that could be used and the levels of engagement and interaction that are starting to develop. Even more interesting was how the avatars become a way for their Ludens (and the Sapiens following the action) to see their own world differently, reframed by these new eyes. <- /\ RECON 16:45: found another shiny thing, this time big flat bit. sapiens claim have no idea what is. what is?